Greetings for the first time since our last email edition on May 31. If you'd rather not receive these occasional email newsletters, click here to unsubscribe. Alternatively, go here for the online version you can share with friends. 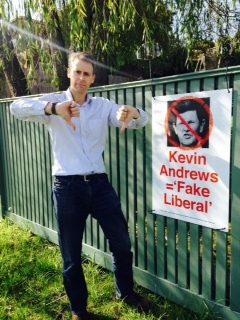 We're all systems go with the Menzies campaign and the "Kevin Andrews = Fake Liberal" corflutes are now popping up around Menzies, raising plenty of eye-brows. If you fancy hosting one - or know someone else who would - just reply to this email with details. The contrast, of course, is the "true liberal" independent alternative. I joined Nick Xenophon, Tim Costello and NXT's key Victorian candidates - Naomi Halpern, Justin Lee and Nancy Bassett - at a press conference outside the Welcome Stranger pokies venue in Bourke St this morning ahead of the pokies protest at the MCG this afternoon. ABC News 24 ran most of it live with ABC and Channel Nine both attending in pooled arrangements with the other networks. Tim Costello lamented the loss of the "real Malcolm", the one who had previously advocated for $1 maximum bets. Nick out-lined the huge numbers impacted by problem gambling - almost 10% of the population when you consider family and friends - and I pointed to the insidious influence of political donations with key politicans like Kevin Andrews happily accepting large donations at the same time as being Tony Abbott's spokesman on gaming matters. The campaign team have been sourcing quotes from firms which deliver recorded messages by telephone, a very cost-effective way of connecting with voters. Hi, it's Stephen Mayne here, the Melbourne City Councillor who is running as a pro Malcolm Turnbull independent candidate in the seat of Menzies at the July 2 Federal election. Your current representative, Kevin Andrews, is a Tony Abbott supporter and sits on the extreme Right of the Liberal Party. I'm a former Liberal staffer but a moderate in the Hamer Liberal tradition, who is currently working well with Liberal Lord Mayor Robert Doyle at the City of Melbourne. If elected as your representative, I have pledged to support Prime Minister Malcolm Turnbull in the next Parliament. I know and like Malcolm - he deserves to be given a chance. I grew up in Menzies and am raising a family here, but Kevin Andrews has lived on the other side of the Yarra in Banyule for his entire 25 years as your representative. That's not very respectful and it show the way Menzies has become "The Forgotten Seat". With very little Federal government funding support because it is so safe, politicians just take it for granted. If elected to represent Menzies and there is a hung Parliament situation, I've done a detailed 3000 submission to Manningham council's budget consultation process outlining $50 million worth of community projects that I would demand be funded. In order to Make Menzies Matter, you've got to make it a marginal seat. Federal promises are currently pouring into neighbouring marginal seats such as Deakin and Chisholm but we haven't seen a cracker from Kevin Andrews so far during this election campaign. If the Liberal Party thinks it is in danger of losing Menzies, at least we might get a few funding promises. If you'd like to know more, please visit www.maynereport.com or call me on 0412 106 241. Thanks for listening and enjoy your day. To help get this message out, just go to our donate page and make a contribution through Paypal. Or, you can send a cheque to PO Box 925, Templestowe 3106. Don't forget that contributions of up to $1500 are tax deductible and the disclosure threshold is $13,000 for those moderate Liberal Party members who don't want to get expelled for supporting a competing candidate. Unlike any other candidate in this election, we are maintaining an online register of all donations, but only disclosing the full name where requested. He (Briggs) points to $16 million in funding for the Bald Hills interchange, on which work is due to begin in September, and funding for the new Fleurieu aquatic centre and an upgrade to Kangaroo Island airport. He promises “more announcements” on infrastructure in Mayo before election day. As was pointed out in this comprehensive submission to the City of Manningham 2016-17 draft budget, Kevin Andrews gave nothing towards the $20 million redevelopment of the Aquarena aquatic facility in his electorate. City of Manningham councillors missed an opportunity to pile the pressure on Kevin during the campaign when they voted against hosting a candidate's forum and commissioning an officer report on the various campaign promises at last Tuesday's council meeting. Despite a request from the Labor candidate to support it, Labor Cr Meg Downie bizarrely voted with the two Liberals and a former Family First candidate to defeat it and protect Kevin from his threadbare delivery record in a 4-4 split vote. It was a good effort by independent Cr Stephen O'Brien to put up the motion, which was supported by Cr Kleinert, Cr Galbally and Cr McLeish. If the majority of Crs were acting in the best interests of Manningham, they would be holding Kevin to account by trying to pressure him into making some long overdue promises. The $50 million of spending outlined in this comprehensive budget submission gives him plenty of projects to choose from and at the very least Canberra could restore the circa $70,000 in emergency relief funding which the Feds cut from the Doncare budget last year. All of these issues will be thrashed out at two other candidate forums which have been organised for later in the campaign by community groups which believe in open debate, even if some of their local councillors are less enthusiastic. Councillors unanimously backed a motion last Tuesday to establish a gift register after a well-handled intervention by Team Doyle's Cr Arron Wood. My original motion would have moved to an online register from July 1, but it was defeated 7-3 with only the two Labor councillors, Jackie Watts and Richard Foster, supporting the move. 1.1 Supports in principle the introduction of an online gift register for Councillors. 1.2 Requests officers to undertake a review of guidelines for similar, successful gift registers including the format recommended by the MAV. 1.3 Request officers prepare a report recommending an appropriate framework and guidelines for the adoption of a gift register to be brought to Council for decision in August 2016. So, we're now fully committed to an online gift register, we've just asked the officers to work up the detail, rather than leaping into it ourselves. This was a sensible compromise and will hopefully lead to a well-designed gift register which is in place for the next council after the October 22 elections. At the moment, the system only picks up gifts above $500 and these are jumbled in with a whole bunch of other disclosures on the register of interests form which is paper based, only updated every six months and inaccessible once a councillor departs. Contrast that with City of Melbourne's exemplary online expenses system which goes back until 2008. Finally, check out this list of the 50-plus transparency reforms that City of Melbourne has implemented over the past 4 years, partly due to the leverage of a having a governance-focused independent from the sensible centre sharing the balance of power between left and right. Imagine what could be achieved in Canberra in a hung parliament situation. We're booked in to formally nominate with the AEC on Monday ahead of the Thursday deadline and will be gathering the final 120 signatures from Menzies voters over the weekend, in conjunction with putting up more corflutes. If you fancy printing out a page and gathering a few signatures from your household and neighbours, you can access the document here and then just let us know where to collect it from by emailing stephen@maynereport.com. The most surprising opposition to anything I've encountered over the past 4 years as a City of Melbourne councillor has been a group of NIMBYs who live near the Carlton Gardens and lodge seemingly endless complaints about the annual Melbourne International Flower and Garden Show (MIFGS). MIFGS is one of the five best flower and garden shows in the world and has been running successfully for 21 years after keen gardener Jeff Kennett got it up and running in 1995. So when the organisers wrote to me recently requesting a new licence, I was more than happy to put up this notice of motion for Tuesday night's council meeting proposing a 3 year extension with a further 3 year option. The NIMBYs have a strategy of lodging endless nit-picking challenges to MIFGS and there was a bit of that on twitter yesterday. Remember, anyone can come along on Tuesday night and ask a question at the start of the meeting or submit on individual items. There may well be a couple of submissions on MIFGS, which is the way the system should work. The MIFGS motion is number 47 as you see from this of all motions lodged since late 2012. It would be nice to finish on the round number of 50 before the term is up. Measuring independent chairs for "skin in the game"
And if you want to see all the research plus the full archive of AGM reports and voting recommendations since 2009, you really should become a member. Click here. We've put together this page online for the Menzies campaign recording comments by third parties over the years. "There are many aspects of your persona and your experience that this board holds in high regard as I do and I believe that you will some day make a very good contribution to boards in Australia." – Roger Corbett, chairman Fairfax Media, 2014 AGM. Click on the image above to join almost 28,000 followers on Twitter. We are regularly dropping out observations about journalism, politics, breaking stories, local government and shareholder activism. We're juggling the usual 5 basketball games today with a further two football games tomorrow, which is always good fun. The kids have also posed for a nice family shot in their sporting gear and our labradoodle Daisy which will appear in a fully page ad in The Warrandyte Diary and The Manningham Leader, both of which are due out early next week. They are enjoying the campaign so far, but are a bit reluctant to head out in the ran today putting up corflutes. * The Mayne Report is an email newsletter and website which promotes transparency and good governance in the corporate, political and media worlds. It is published by Stephen Mayne, the founder of Crikey.com, shareholder advocate, ASA director and City of Melbourne councillor. To unsubscribe from this email list, click here. Authorised by Stephen Mayne, 90 Swanston St, Melbourne 3000.